For a wireless connection to work well, both sides of the connection need to be able to reach each other. Even though you may succeed in making your router transmit a stronger signal that reaches further, there is no guarantee that the signals returned by your wireless clients—computers, smartphones, and so on—will be able to reach the router. In this case, all you have achieved through signal boosting is sabotaging yourself by making your coverage less predictable than it was in the first place. 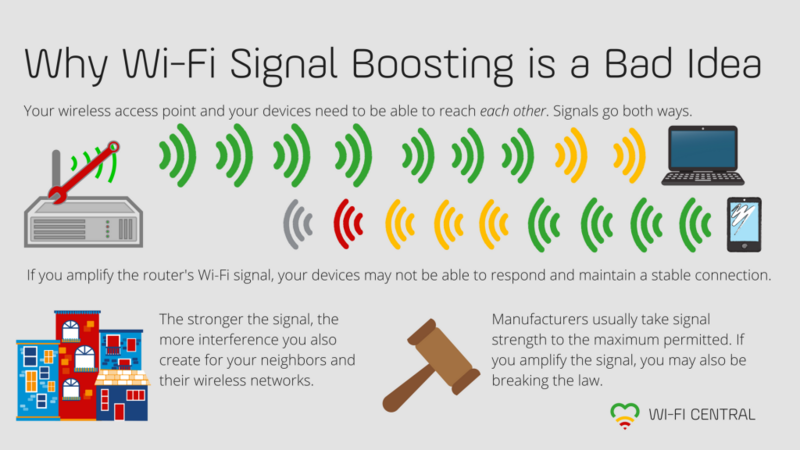 By boosting the Wi-Fi signal, you can extend its reach, which sounds like a good thing. However, as the frequency band with the longest reaching signals (2.4 GHz) is also the band with the most interference/wireless “noise”, extending your signal further will contribute to even more interference for your neighbors. Actually amplifying your router or extender’s wireless signal to extend its reach runs the risk of being illegal in many countries. Local laws in for example Norway clearly specify both what frequencies and which signal transmission strength are allowed for indoor and outdoor wireless networks. Extending the antenna using a soda can, Pringles tube, or similar. Note that while Wi-Fi extenders or repeaters are sometimes referred to as Wi-Fi “amplifiers”, there is no actual amplification of signal strength involved. The repeater/extender simply repeats the signal from the router to a new network to extend wireless coverage. So what can you do instead, when the signals are looking too weak? Here at Wi-Fi Central you will find plenty of advice on mapping and improving your coverage in ways that are both fully legal and completely free. We suggest starting here: Stop Clearing Away Your Wi-Fi Signal.